REFURBISHED INOKIM QUICK 2 NOW AVAILABLE! 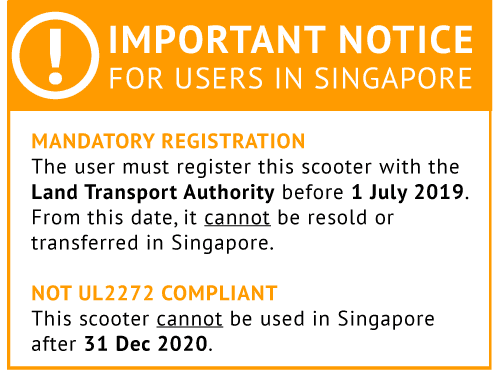 Our pre-owned electric scooters come with a 6 month limited warranty and look like-new! The INOKIM 2015 is the new and improved MYWAY. Officially launched in April 2015, you will be among the first to get your hands on them by ordering today! The INOKIM QUICK 2 (2015 Version) is the latest and greatest Electric Scooter to come from the MYWAY company. It is a personal, compact, light electric vehicle which allows you to travel anywhere within a 25-30km range without breaking a sweat on one battery charge. A modified version of its predecessor, the MYWAY, the INOKIM is the last mile solution for all your commuting problems, bypass the endless traffic jams and crowds in Singapore, be it on the road or on the MRT. The INOKIM is also a perfect recreational device, enabling you to move freely whenever you want. Designed and developed in Israel by Nimrod Sapir, it is an award-winning product that is now released into the mass market after 4 years of R&D and field testing under different rugged conditions. There is no other kick scooter like it in the market. Smooth in both manual and electric mode, the INOKIM is truly made for the hard knocks of the roads, but designed to stand out amongst the hippest neighborhoods. With INOKIM’s new digital display, you will have all the information you need at your fingertips, showing your Speed, Distance travelled and battery life. You can now either use the standard thumb throttle made popular by the MYWAY Quick, or use the new thumb free INOKIM wrist twist throttle - accelerating with just the twist of your wrist. With INOKIM’s new throttle control, you can change between 3 speed levels! Never worry about losing control of your speed again! The new INOKIM QUICK 2 (2015) handle bar is designed to maintain the same ergonomic curved feature of the original MYWAY to provide the most comfortable ride, but is now longer to provide even greater stability and comfort to your ride. It now features foldable handlebars to make the INOKIM more compact and portable than ever. The INOKIM Quick 2 (2015) features a new carry handle to allow for great portability. Designed to provide greater comfort when carrying for longer distances, the handle will be a treasured feature by many. The INOKIM is capable of traveling for long distances (25-30km) on one charge of its lithium ion battery and can carry a load of up to 120kg. It is capable of traveling at a speed of 25km/h at the simple press of a button, and has an incredibly strong motor enabling it to tackle high hills (25 degrees). Other Electric Scooters on the market will struggle with even simple hills. The INOKIM weighs just 14.5kg and can be folded within seconds for easy storage or carrying around. Check out Singapore's favorite tech blog Techie Lobang's independent review on the INOKIM here! *User manual for the Inokim Quick 2 can be downloaded here.